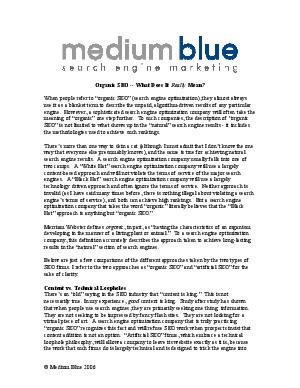 > Medium Blue > Organic SEO - What Does It Really Mean? Organic SEO - What Does It Really Mean? Learn how an organic SEO firm works with site content instead of manipulating technical loopholes, attracts links instead of utilizing linking schemes, strives to make a website a valuable resource, and learns from the search engines rather than learning how to exploit them.